Tune in to Android Central’s OnePlus 6T AMA on Twitter today! Filed Under: Android News by Android NewsPad — Comments Off on Tune in to Android Central’s OnePlus 6T AMA on Twitter today! We’ll get things started right after the 6T event. At 11:00 AM ET today, OnePlus will begin its event in New York City to announce the highly-anticipated OnePlus 6T. We’ll have plenty of coverage here on AC for you to check out, but if you have any burning questions about the phone that you want answered, we’ll also be hosting an AMA over on Twitter once the event wraps up. You can now tune into your favorite tracks on Amazon Prime Music using your Denon HEOS wireless sound system. The two companies have partnered up to offer the music streaming service on said speakers via the official HEOS app on iOS, Android and Amazon Fire hardware. You’ll be able to access more than a million songs, as well as curated playlists and enjoy a great-sounding experience from the palm of their hand. Almost a year and a half after its acquisition by Google, music streaming service Songza is preparing to play its final tune. It was revealed today that Songza will shut down on January 31, 2016, allowing users to transition their accounts to Google Play Music. Samsung has commenced sales of the Galaxy S5 Mini in India, with retailer Flipkart getting exclusive rights to sell the handset in the country for Rs. 26,499 ($ 435). The retailer is offering the Galaxy S5 Mini in four color variants — black, blue, gold and white — and is throwing in a Sennheiser HD180 with every purchase. Customers will also receive free ebooks worth Rs. 2,000 ($ 32) for free. Are you in need of a fun way to do occupational therapy? 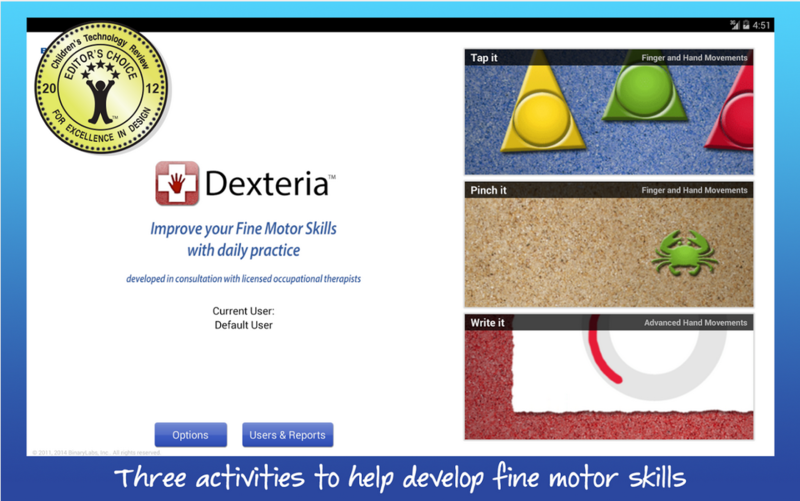 Dexteria VPP Fine Motor Skills offers a fun solution to help you progress your abilities.